Home Uncategorized Ten to One fundraising has generated $700. to date! The new club fundraising initiative, called “Ten to One” was the brainchild of our fundraising committee. The name means the number of team i.e. “TEN” working towards “TO ONE” goal. In the fall of 2018, each team was asked to raise a minimum of $200 from September 2018 to June 2019.There are a total of ten teams with a maximum of 4 people on each team. This fundraiser offers versatility for those away during the winter months, cannot attend scheduled fundraising committee meetings, want to volunteer when they are available and like to work with smaller groups of club members. Fundraising activities can be any idea that the group comes up with. It can be an activity that utilizes the skills and talents of the team members. Ideas may include hosting coffee and food events, bake sales, making and selling crafts such as knitting, getting sponsors where you perform a task that benefits your local community etc. 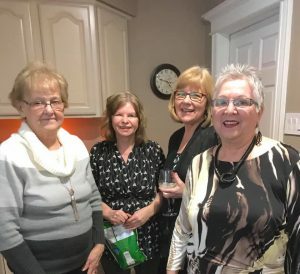 These fundraisers are also an opportunity to spread the word about Soroptimist International of Peterborough and potentially attract new members. Each team name was the name of a woman who was influential, important and are role models. Some examples are; Violet Richardson, Maya Angelou, Gloria, Steinem, Mother Teresa, Eleanor Roosevelt and Malala Yousafzai. Fundraisers to date (March 17th) include; a wine and cheese event, a turkey dinner which was held on International Women’s Day and purchasing gift cards where a percentage of the value goes to SI Peterborough. The funds support our Signature programs, Live Your Dream and Dream It Be It.